WHEN ARCHITECT CANDACE MILLER SET OUT to draw the plans for a vacation home in Big Sky, Montana, there was one restraint. “[We] did not want a cowboy house,” recalled the owner. There would be no saddle-topped bar stools, spurs as bookends or longhorn steer mounts in this house, the owners assured Miller. Hence, for the structure, Miller recognized the owners’ appreciation for the traditional high gabled roofs, for straight-talking spaces and expansive windows, and the simple elegance that comes from the clean lines of a solid home. What this couple from Houston, Texas loved about the West was the natural, reclaimed materials that are hallmarks for Miller Architects, of Livingston, Mont. Stone, wood, metal — honest materials that reflect the simplicity of life in the mountains. They brought Miller to their property in the hills that edge Big Sky’s meadow village and took a walk. But more than anything, the homeowners and Miller had an easy personal connection, which was essential for a great professional relationship. Similarly, they selected general contractor, Bergerson Construction for the project because there was an immediate connection of trust. Drawing inspiration from the hillside site, Miller easily skirted the kitsch of the cowboy way. She looked to the sweeping meadow, the light filtering through the old growth Douglas fir forest and to the jutting rocks on the mountaintop above and incorporated the essence of each into her design. As a result, the home, though traditional in structure, has an organic presence on the land. Nestled between the trees, a quiet shape in the filtered sunlight, it belongs here. Pulling from elements that the owners loved, such as a photo of a French country stone outbuilding and a dream of a cabin in the woods, but with a contemporary twist — one that was not dark and shady, but open, airy and clean — Miller deftly responded with a design that is straightforward in its lines and balanced in proportions to honor the rustic materials. 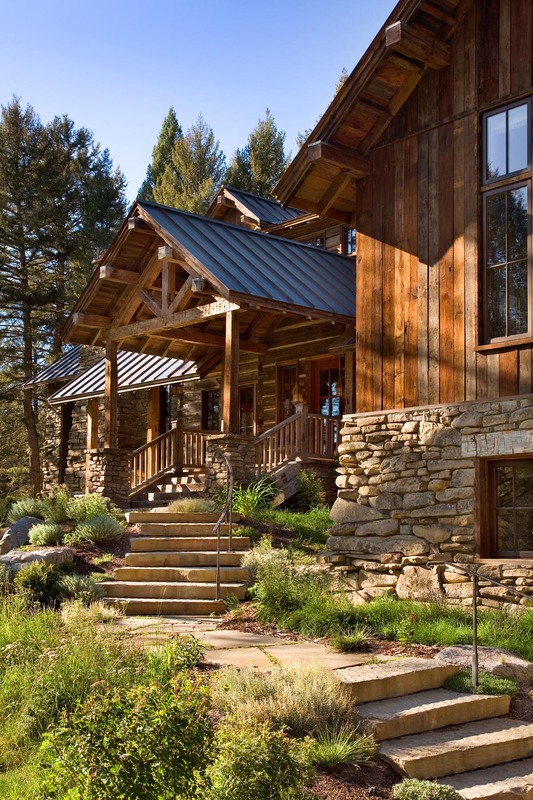 Utilizing a combination of stacked stone, antique hewn logs and reclaimed barnwood, topped with a classic copper roof, the house upholds its Western roots through materials, while hinting at the sophisticated tradition within it’s structure. A former interior designer, the lady of the house, decorated the home with eclectic finesse by combining antiques with custom furnishings. 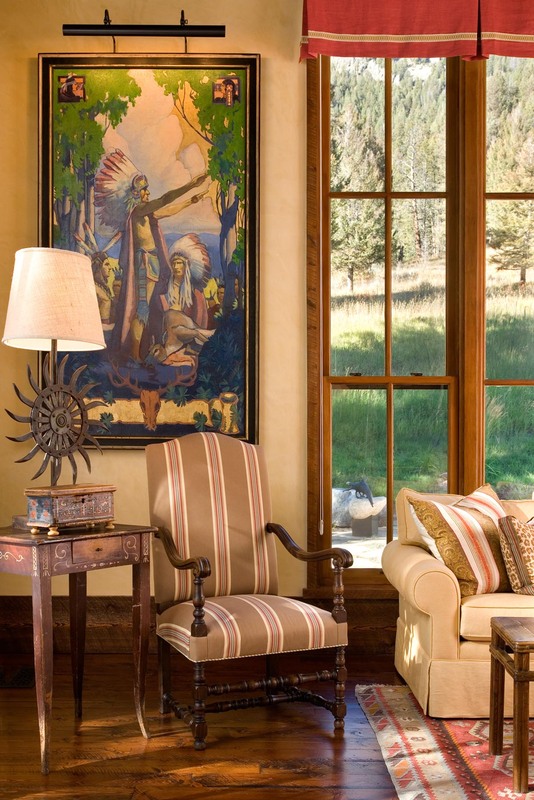 Choosing an earthy color scheme and combining it with European influences that reflect a style which feels collected over time rather than commercially produced, every piece, from furnishings to art carries a story with it, linking the Montana experience to the owners’ life back in Texas. The result is a pleasant blend of formal style with casual living. Likewise, Miller reflected this sensibility in the architectural details. Although the main area has an open floor plan tailored for modern living, each room observes a traditional separation of spaces delineated by the use of different materials, ceiling heights and visual dividers. Specifically, the living room focuses on the views outside with a sense of expansiveness gained by a vaulted ceiling. Next to it, the dining room conveys a level of intimacy with a lower ceiling of plaster and square reclaimed beams overhead. The kitchen is separated by a small raised bar with stools for seating. The result is three individual spaces that are still essentially connected to allow for a long view of Lone Mountain through the trees and daylight on all sides. Visiting the house, years after it has been finished, Miller surveys her work with almost fresh eyes. She scrutinizes the way the materials have weathered, noting the warm tones that the wood still holds and the way the copper roof has a dark patina. She sees past the art, pigmented plaster and bright furniture; she sees the bones of this house. What she sees is good, it’s a house that looks like it belongs here. With nary a tree cut to accommodate the home’s footprint, the two-story building captures the precious southern exposure of the day on one side and maximizes the element of privacy on the other. This equates to intimate outdoor spaces that connect to the alpine meadow and the surrounding woodlands. 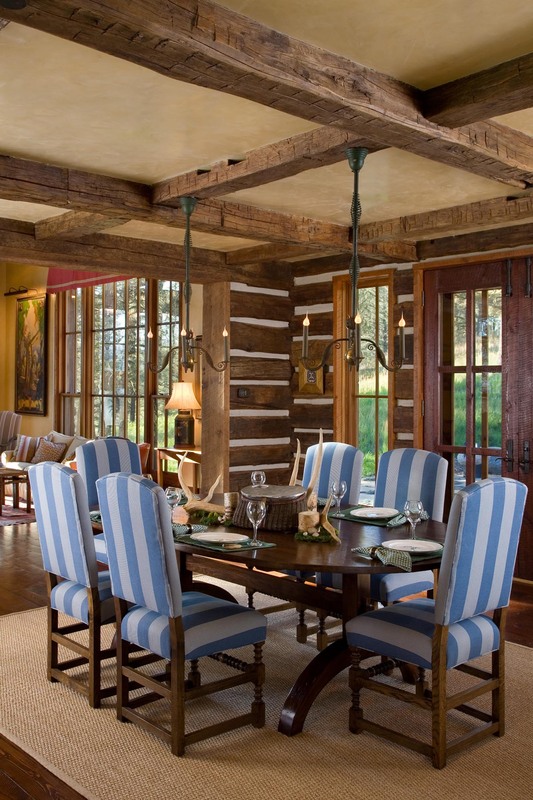 The blue and white striped upholstered chairs, coupled with a custom-designed trestle table add a pop of formality to balance the rustic elements of the architecture. In the living room generous mullioned windows connect to the landscape and illuminate the interior spaces with natural light. A thoughtful art collection echoes the vibrant color palette of warm red, yellow, green and blue. 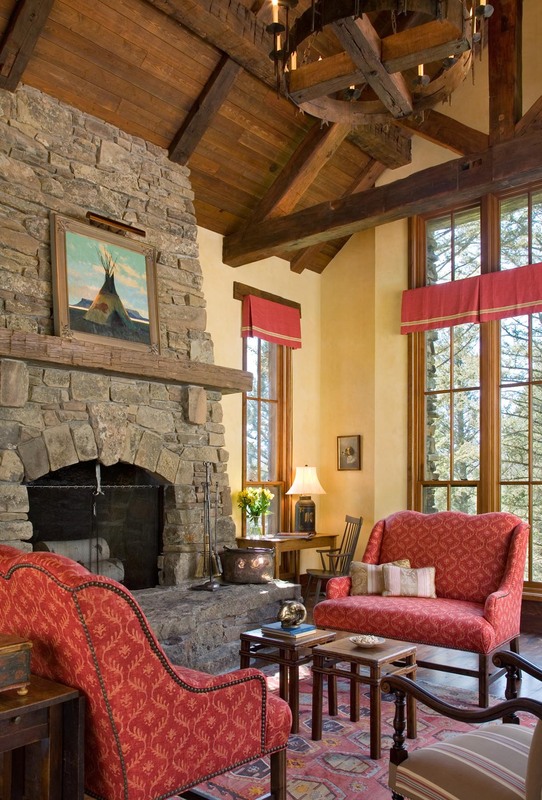 Paying tribute to the region’s Native American influence, a romantic tipi from Montana artist Tom Gilleon sits above the mantel. 1930s-era and contemporary paintings pepper the living and dining area. An historic painting by S.J. Bolanski anchors the collection.